Life is normally slow in Cameroon. It feels like a country in a deep sleep. Nothing changes in politics. There is corruption. Paul Biya has been the President since 1982 and a few powerful people of the same age lead the country. The few leaders are getting old. President Biya will be 85 when he stops being President in 2018. His political opponent, John Fru-Ndi of the Social Democratic Front, is 74. If Biya dies when he is still President, the leader of the Senate will be President and he is 82. With old age there is fear of change. President Biya has stayed away from regional politics and didn’t even go to the celebration of his 30th year as President. Nothing is changing socially or economically. But one positive thing is stability. The big problems in the region have not really affected Cameroon. It has been free from serious violence except for a coup attempt in 1984 and, in recent years, Boko Haram moving into the north of Cameroon. There were riots in 2008 to change the constitution and there have been some protests and strikes since, but nothing that will change things. But the people of Cameroon know that it is possible that the country could have big problems. There are possible problems between the few English speaking people and the mostly French speaking people, between the Muslim north and Christian south, and between about 250 ethnic groups. And there are newer possible problems between rich and poor and young and old. Like much of the rest of Africa, in Cameroon there is a very big population of young people and very high unemployment. The bad feelings that there are in society are helped a little by government money for fuel. This is of course expensive for the government. It is also difficult to know how bad people are feeling because of the way the government controls journalists, activists, and opponents. But the feelings of the people are real and are getting worse. There are fears of religious extremism, especially in the Muslim communities with Boko Haram brutality. And people talk about division in the army. At the moment there isn’t a way for people to talk about these problems. President Biya’s Cameroon People’s Democratic Movement won 82 per cent of seats in the last elections and controls politics. While Biya is President, the problems will stay hidden. But when he leaves, the problems may come out in the open. It is not clear if the old leaders will be able to look after these problems. It is difficult to say what situation the country will be in then. Leader: President Paul Biya (since 1982). Economy: Gross national income (GNI) per person $1,350 (Gabon $9,720, France $42,960). Money: CFA (Coopération Financière en Afrique Centrale) franc. Main export: Crude oil and oil products, timber, cocoa beans, coffee, cotton,aluminium. The low oil price will be a problem now for Cameroon – almost 40% of its income from exports comes from oil. But it has good agriculture. Its poor economy does not satisfy the IMF, international business, or the poor because of corruption, inequality and no political change. The government gives more importance to financial support for food and fuel/power than to education and healthcare. People: 22.7 million. Annual growth rate 2.5%. People per square kilometre 48(France 121). Health:Infant mortality 57 per 1,000 live births (Gabon 36,France 4). Lifetime risk of maternal death 1 in 34 (France 1 in 4,300). HIV is 4.8%. Environment:Losing its forests is the biggest problem– Cameroon lost 13% of its forests between 1990 and 2005 and it is getting worse. 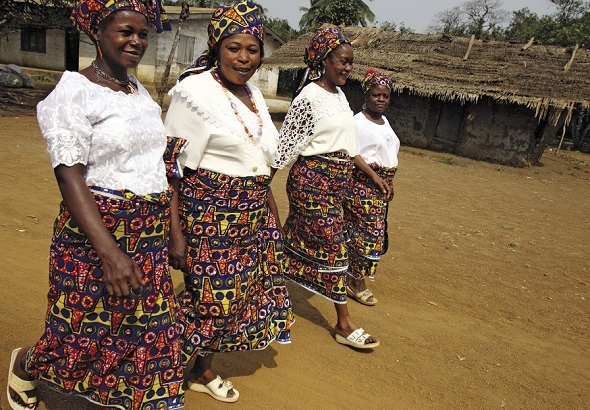 Language: There are at least 24 African languages but French and English are official. English because of British rule of the southwest between 1918 and 1961, when northern Cameroons chose to join Nigeria and southern Cameroon voted to become part of independent Cameroon. Religion: Generally 40% indigenous beliefs, 40% Christian, 20% Muslim. Human development index:0.512, 153rd of 188 (Gabon 0.684, France 0.888). Income distribution:Inequality is not as bad as in many other African states, with a lower GINI coefficient than the US, partly because of financial help with food and fuel. But there is a lot of poverty - about 40% of the population lives on less than $2 a day. Life expectancy:55 years (Gabon 64, France 82); it has not really improved from 1990 - 53.6. Position of women:In 2013 elections MPs doubled to 31%, but women face inequality, bad treatment, and sexual violence. There was a recent campaign against the modern way women dressed and many women die when having babies. Literacy:There is information that over three-quarters of the population are literate. But only half of Cameroon’s children get a secondary education. Freedom:There is independent media – press and radio/TV. The government is OK with some criticism but it makes things difficult for journalists. The government says no to meetings and demonstrations. Sexual minorities:Homosexuality has been illegal since 1971 and carries five years in prison. There have been fewer arrests in recent years, but there is bad treatment, discrimination and violence against individuals, activists and supporters of LGBT rights. NOW READ THE ORIGINAL: http://newint.org/columns/country/2016/03/01/cameroon/ (This article has been simplified so the words, text structure and quotes may have been changed). This page was last edited on 1 April 2016, at 16:39.